Jeremy and Tersia Puren welcome you to come and spend some quality time on their 110ha farm, Eenuurkop, situated in the foothills of the Langeberg mountains, beneath the majestic Eenuurkop Peak. 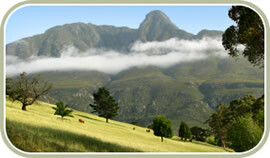 The farm is situated only 5 km from the historic town of Swellendam, on the R60. Experience the beauty of nature around you from the privacy of your own cottage. Self-catering accommodation is provided in three separate well-appointed cottages, situated in a beautiful country garden setting with complete privacy, and breathtaking views. The love and care that has been put into this farm over the years will revive you. It is one of many things that will long be remembered after you leave here. 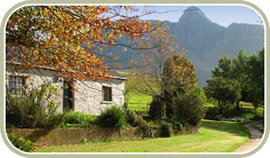 © Eenuurkop Guest Cottages. All rights reserved..